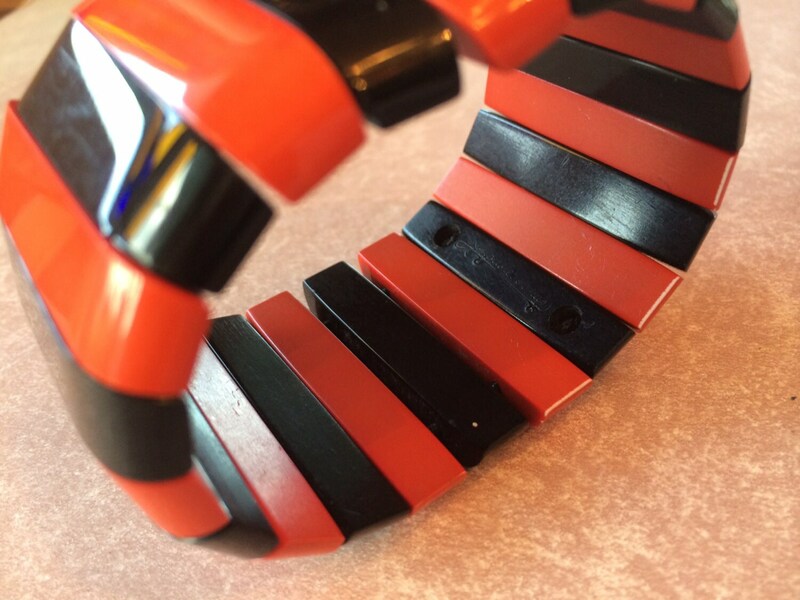 This is one of his bracelets that was highly influenced by Cubism. I have included below some information about Bonaz. 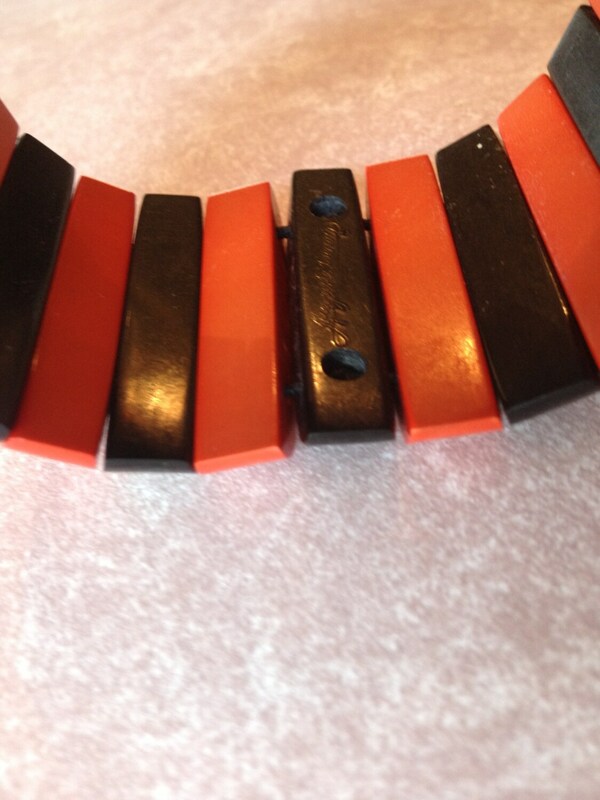 This bracelet is in incredible period appropriate condition. 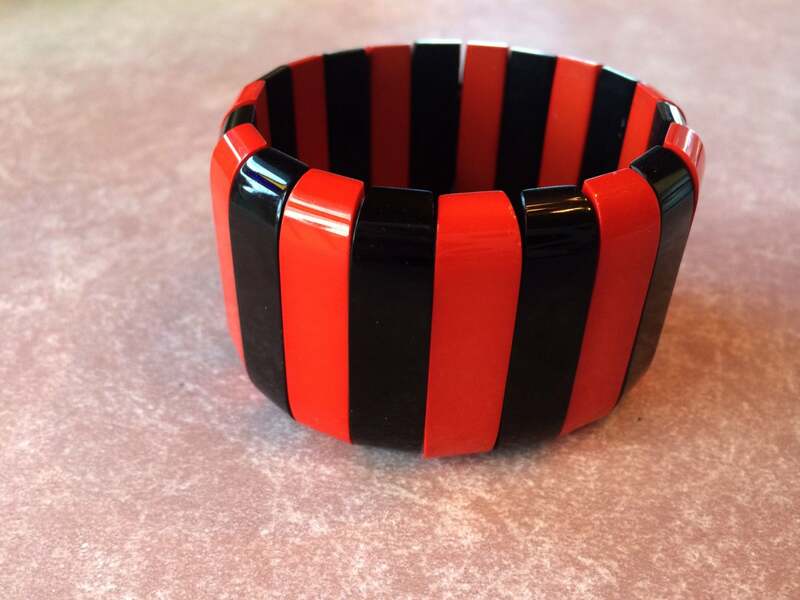 This listing is ONLY for the stretchy Bonaz bracelet. I have included some photos of other period items from the same collection and a Bonaz necklace that will be listed as well. Today, these pieces have become almost impossible to find, but continue to attract attention for their revolutionary design and wearability. Galalith was dis­cov­ered com­pletely by acci­dent. In 1897, Wil­helm Krische, a fac­tory owner in Ger­many, was com­mis­sioned to cre­ate white writ­ing boards for teach­ers that could sim­ply be wiped away. White chalk had become an old-fashioned nui­sance and instruc­tors wanted to write in black and white. Using a pro­tein found in milk, casein, he devel­oped a for­mula for a type of plas­tic that was quick and inex­pen­sive to pro­duce. The mate­r­ial could be dyed, cut, pol­ished, or drilled, and mim­ic­ked gen­uine stone well. The name was a mar­riage of two Greek words: gala, mean­ing milk and lithos, mean­ing stone = milkstone. Maison Bonaz was started around 1910 by César Bonaz, who founded his firm in Oyonnax, located in the east of France. 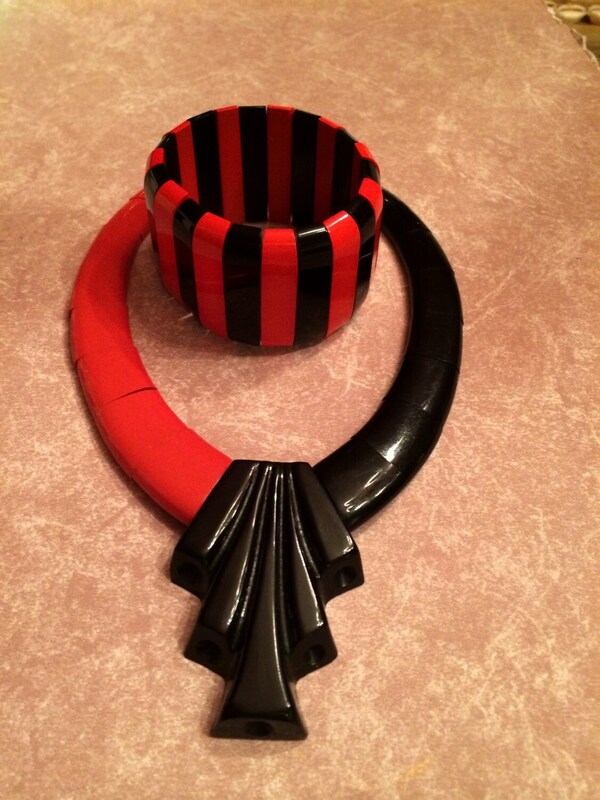 At that time, they primarily created jewelry to be worn in the hair made of cut and carved horn. Extravagant hair combs were an important fashion accessory, and remained so through the 1920's. Auguste joined his father's firm, and pioneered in working with newly developed synthetic materials such as Galalith - derived from casein - a protein found in milk, and also Bakelite, but Galalith was his preferred material. Auguste unfortunately died in 1922, and his widow, Marguerite Marie Bailly continued the firm, and made the name of Auguste Bonaz famous. 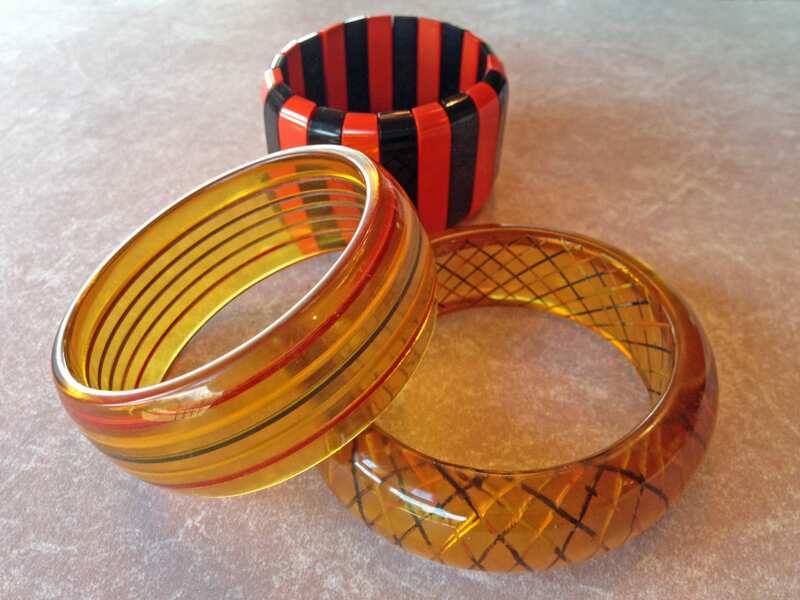 The striking originality of design and materials made these pieces very desirable in the 1970's, when Art Deco was recognized as one of the most important and influential design movements of the 20th century. Necklaces and bracelets by Bonaz were purchased, often in quantity (when it was available), by art collectors and dealers, among the Ilyana Sonnabend and Andy Warhol.